Overview: This multidisciplinary research measures the response of a small coastal catchment to extreme events in order to assess the resilience of the Irish landscape to both short- (event scale) and long-term (climate change) drivers of change. To fully grasp the implications of a changing climate in Ireland, we need to understand the complexity that drives the variability within our natural systems (climate, hydrological, geomorphological, biological, and ecological) where one small change (tipping point) in one system can lead to numerous significant, and sometimes irreversible changes, in one or more connected systems. This integrated, cross-disciplinary study will measure patterns in the sediment and water routing system, specifically, the transport of sediment and solutes from the net-erosional (source) to the net depositional (sink) parts of the system. 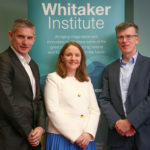 The EPA-funded project Irelands Climate Information Platform (ICIP) is developing a development stage, one stop web-based resource of climatic and adaptation information for Ireland. This research will contribute to ICIP through: the provision of information and data on the responses of vulnerable ecosystems in Ireland to climatic changes and the development of recommendations for the management of these ecosystems. This information will be provided to ICIP in order to increase decision-makers understanding of the resilience and dynamics of vulnerable ecosystems in Ireland and how these might change under projected climate changes. The research couples expertise-driven multidisciplinary research with policy so as to build capacity at local and national levels. Overview: Universities have recently realigned their extracurricular activities and expectations from staff to do far more than just preparing students for careers in Industry. There is now much more emphasis on contributing to civil society, in building sustainable communities and creating well rounded citizens of the community. This research is a recent partnership between Galway City Council and students and staff of National University Ireland Galway to provide science education of the coastal and marine environment of Galway using a series of attractive, easy-to-read, display boards. The I Like Beaches (ILB) project developed working partnerships between the university, the community and the local government and established the willingness of the public to learn about, and participate in, protecting Galways coastal resources. The potential longer lasting impacts of the project are building trust within the wider community which facilitates future natural heritage projects in Galway. The ILB project template and skills are readily transferable to different environments (riverine, wetland, glacial) in other locations in Galway or Ireland. The students have benefited by (1) taking an idea and working to turn it into reality to initiate change in the community; (2) CV building through professional project management experience, project activities and networking; and (3) participating within a Group and having different roles and responsibilities during different stages of the project. Dr Kevin Lynch lead a work package on coastal land planning. This work package initially created a database of all relevant stakeholders and available resources, and followed this by developing a didactic handbook for coastal land planners that outlined national legislative tools that supported a consideration of coastal risks in their decision-making process. He was also responsible for managing and reporting of NUI Galway budget. Other activities included: organising a national seminar in NUI Galway (120 participants), producing a set of good practice handbooks, hosting international case study visits. Partners: NUI Galway, University of Ulster, Coleraine, Kings College, London and RWDI, Ontario.